This testimony is limited to the underground Roman Catholic Church in China. The promise of religious freedom in China by the Chinese government is a false one. Since 1949 when the communists took over China, the Chinese government has not stopped persecuting members of China's spiritual communities such as Roman Catholics, Protestants, Evangelical Christians, Tibetan Buddhists, Uighur Muslims, Falun Gong movements, and other spiritual communities. The Chinese Government views religion as a threat to its power. Accordingly, it restricts religious activities to government-sanctioned organizations and registered places of worship. It seeks to stamp out those religious activities that are not government-sanctioned. Those religious groups that defy the control of the government face severe consequences: mass campaigns, surprise raids, imposition of heavy fines, imprisonment, and torture. China therefore has two churches that call themselves Catholic. One Church was established by atheist Chinese communists 49 years ago in 1957. The Chinese government established this Church because it failed to destroy the Roman Catholic Church after 7 years of severe persecution immediately after the communists took over China in 1949. The objective of the Chinese communists in creating this church was to replace the Roman Catholic Church in China with a puppet church that is entirely controlled by the government. It is under the protection of the Chinese communist government, and has not been persecuted. It is independent from the Pope. Contrary to the Roman Catholic Church's Canon Law, this Church has elected many of its own bishops without prior approval of the Pope. This is the official Church, otherwise known as the Patriotic Association. In his speech on December 3, 1996, the late Pope John Paul II apparently referred to the Patriotic Association as "A Church which does not respond either to the will of the Lord Jesus, or to the Catholic faith." The other Church was founded by Christ approximately 2000 years ago. It is in full communion with the Pope in the Vatican, but not registered with the Chinese government. This is the underground Roman Catholic Church which is illegal in China. It has been persecuted by the Chinese government for the last 57 years since 1949. In the same speech on December 3, 1996, the late Pope Jon Paul II proudly proclaimed this underground Church as "a precious jewel of the Catholic Church." 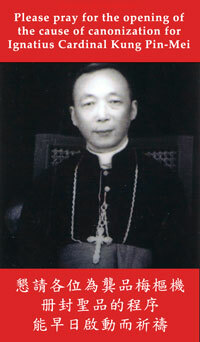 One bishop, Bishop Gao Kexian 高可賢, Bishop of Yantai 煙台, Shandong 山東, was arrested in October 1999. We did not know where he was until he died in jail in January 2005. His cause of death was unknown and is still unknown. We know for sure that eight bishops are now in jail They are Bishops 1) AN Shuxin 安樹新 of Baoding 保定, Hebei 河北, 2) HAN Dingxiang 韓鼎祥of Yong Nian 永年, Hebei, 3) JIA Zhiguo 賈治國 of Zhengding 正定, Hebei 4) LIN xili 林錫黎 of Wenzhou 溫州, Zhejiang 浙江, 5) SHI Enxiang 師恩祥of Yixian 易縣, Hebei, 6) SU Zhimin 蘇志民 of Baoding, Hebei, 7) YAO Liang 姚良of Xiwanzi西灣子, Hebei, and 8) ZHAO Zhendong 趙振東 of Xuanhua 宣化, Hebei. They are all in their 70's or 80's. Three of them have disappeared. (AN, HAN, and SU). Out of these three, two (AN and SU) have disappeared for more than 8 years and one (HAN) has just disappeared several months ago after being detained approximately 5 years. We do not know whether they are dead or alive. One (JIA) of these eight bishops has been arrested at least 8 times since January 2004. The last time he was arrested was November 8, 2005. Among all the bishops arrested, the most important and famous bishop is Bishop Su Zhimin. The most recent news report on Bishop Su is as follows. November 19, 2003: Underground Bishop of the Roman Catholic Church in China "lost" for More Than 6 Years Found Very Ill in Government Detention. Bishop SU Zhimin 蘇志民主教, the underground Roman Catholic Bishop of Baoding 保定, Hebei 河北 in China, was arrested and jailed on October 8, 1997, and had not been heard from or seen ever since. Inquiries to the Chinese Government from various U.S. government and non-government agencies about Bishop Su's whereabouts and his well being were never answered satisfactorily. For six years since October 8, 1997, we as well as many other concerned organizations could not be certain if Bishop Su was still alive. The Cardinal Kung Foundation 龔樞機基金會 has just received information that on or around November 15, 2003, Bishop Su Zhimin was taken to the Officers' Ward of the Baoding Central Hospital in Baoding , Hebei for an eye operation and for heart ailments. He was heavily guarded by approximately twenty plain-clothes government security personnel, including Mr. JIA Ruiqi 賈瑞琪, who is a high ranking officer of the public security bureau of Baoding . It was reported that the name of SU Zhimin is not officially registered in the hospital record. Bishop Su is a prominent leader of the underground Roman Catholic Church in China and is probably the only underground bishop who has met a US Congressman. He met privately with Congressman Christopher Smith (NJ) in January 1994 during Congressman's official visit to China . Immediately after the departure of Congressman Smith from China , Bishop Su was arrested and detained for 9 days. Bishop Su has been arrested at least 5 times and spent approximately 27 years in prison thus far. He was once beaten so savagely in prison that he suffered extensive hearing loss. He escaped from police detention in April 1996 and remained in hiding until October 1997. While in hiding, he wrote to the Standing Committee of the People's National Congress requesting it "to thoroughly investigate the serious unlawful encroachment on the citizen's rights, and to administer corrective measures to restore order and control to ensure that the civil rights and interests of the vast number of religious believers are protected." He was rearrested in October 1997. Priests, seminarians, nuns and laypersons face similar harassment. We know for sure that there are approximately 25 of them in jail or in labor camps. This list is by no means complete, because of the difficulties in obtaining details. Many cases are not reported here. My educated guess is that there are hundreds in jail. February 23, 2006: Two Underground Roman Catholic Priests Arrested in Hebei. Father LU Genjun 鹿根君, 44 years old, and Father GUO Yanli 郭彥利, 39 years old, who belong to the diocese of Baoding 保定 in Hebei 河北, were arrested on February 17 while waiting for a friend at the Baoding train station. Father GUO was sent to Xushui County 徐水縣 detention center while Father Lu was sent to an undisclosed location. We do not know why they were arrested and have no other information on their arrests. Father Lu was previously arrested on Palm Sunday, April 5, 1998 for a short period and was arrested again shortly before Easter in 2001 and detained for three years in the Gao Yang County 高陽縣 labor camp in Hebei.. Shortly after his release from the labor camp, he was arrested again on May 14, 2004 for an unknown period. He was ordained a Roman Catholic priest in 1990. January 4, 2006: An Underground Roman Catholic Priest Arrested in Hebei. Another Underground Bishop Has Disappeared. Father Wang Wenzhi 王文芝, fifty years old, a priest in the diocese of Yongnian 永年in Hebei., was arrested by Chinese security officials after he finished offering his Mass in a family's private home on December 11, 2005 in Fengfeng City 峰峰市, which is located southwest of the City of Handan 邯鄲市, Hebei. He has been kept in the detention center of Guangping county 廣平縣 ever since. We understand that the Chinese government is attempting to brain-wash and force Father Wang to cooperate with the government in order to join the official communist-established Patriotic Church. We have been informed that the government has not been successful in its attempt to convert Father Wang to their official Church. In the meantime, Bishop Han Dingxiang 韓鼎祥主教 of Yongnian has disappeared. He had been arrested by the Chinese government more than six years ago in December 1999. Since then he was kept in a government-run hostel somewhere in the diocese of Yongnian and, up until now, people were sometimes able to get a glimpse of him at his window. But, no longer; he has been transferred to an unknown location and we have no news of him. His health has been poor. November 28, 2005: Six Underground Roman Catholic Priests Arrested. Six underground Roman Catholic priests, all belonging to Bishop Jia Zhiguo's 賈志國 Diocese of Zheng Ding 正定) in Hebei 河北 Province, were arrested ten days ago on November 18. Father Wang Jin Shan 王進山 and Father Gao Lingshen (高嶺深), both in their 50s, were not only arrested, but were also severely beaten. Father Gao Lingshan bled profusely from his mouth. In addition, Father Guo Zhijun 郭志軍, 36 years of age, Father Zhang Xiuchi 張秀池, 60 years of age, Father Peng Jianjun 彭建軍, 30 years of age, and Father Zhang Yinhu 張銀虎, 45 years of age, were first ordered to be under house arrest on the same day, but were later officially arrested and were detained in the Gaocheng 高城縣 security bureau. No other details are available. November 17, 2005: An Underground Roman Catholic Priest and Ten Seminarians Arrested. A Roman Catholic underground priest, Father Yang Jianwei 楊建偉, and ten seminarians were arrested in the afternoon Beijing time November 12, 2005. Six seminarians are from outside of the Baoding 保定, Hebei 河北area. The other four are from Baoding. The arrest took place in a nearby village of Xushui City徐水縣城 in Hebei by approximately 20 government security officers. We do not know why they were arrested. Many religious books and RMB 7,000 were taken away by police. After being detained for three days, those six seminarians who are from outside of Baoding were released and were sent back to their home towns instead of being sent back to their seminary. The other four seminarians from Baoding are still kept in police custody, and their whereabouts are unknown. They are FAN Fubin 范富彬, WANG Yongliang 王永亮, WANG Chunlei 王春雷 and LI Yutao 李玉濤. Father Yang, who is 33 years of age, is still kept in police custody and his whereabouts are also unknown. Father Yang was ordained an underground priest in 2000 and was born in Shakou Village 沙口村 of Xushui City. Shakou Village has an underground Roman Catholic population of approximately 1,000 people. November 9, 2005: Underground Roman Catholic Bishop Jia Zhi Guo Arrested Again in China.. Two Other Underground Priests of the Same Diocese Also Arrested. Bishop Jia Zhi Guo 賈志國主教, the underground Roman Catholic Bishop of the Diocese of Zheng Ding 正定 in Hebei Province 河北省, was arrested again by Chinese government security officials at his house at approximately 8:00 am Beijing time yesterday November 8, 2005. The officials, having ordered the bishop to bring his clothing, drove the bishop to Jinzhou City 晉州市 where several other security officials were waiting in order to drive the bishop to Shijiazhuang City 石家莊市. The security personnel told the public that the bishop was taken away for a "study session." We have no idea how long Bishop Jia will be taken away. Bishop Jia is 70 years old and was ordained a bishop in 1980. He was previously in jail for approximately 20 years and has been under strict surveillance for many years. He takes care of approximately 100 handicapped orphans in his house. This is the eighth time we are aware that Bishop Jia was arrested since January 2004. September 4, 2005: Under Roman Catholic Priest and a Recently Graduated Seminarian arrested in China. Underground Roman Catholic priest Father PANG Yongxing 龐永興 and a recently graduated underground seminarian Mr. MA Yongjiang 馬永強were arrested at approximately 3 PM on Friday, September 2, 2005, by the Security Bureau of Qing Yuan Xian (county) 清苑縣, Hebei. Seven or eight police vans were mobilized for this arrest. The 32 year old priest, Father PANG, was born in Pang Qu Village 龐家庄of Qing Yuan County清苑縣, Hebei. 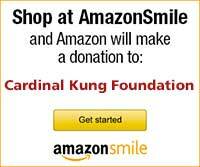 The Cardinal Kung Foundation reported on July 26, 2002 about Fr. PANG's last arrest in 2001 when he was sent to a labor camp for three years. Since his release one year ago, he has been working in an underground church in Qing Yuan County which has approximately 800 underground Catholics. July 28, 2005: Underground Roman Catholic Priest and His Parishioners Beaten and Arrested in China. Father LIN Daixian 林代先, an underground Roman Catholic priest belonging to the Pingtan 平潭 parish of the Fuzhou 福州 diocese in Fujian 福建, a seminarian and 9 parishioners were arrested by Chinese security personnel on July 25 at approximately 8 o'clock in the evening (Fujian time). The arrest was carried out during the celebration of a private Holy Mass in a private home in Pingtan, attended by approximately 50 faithful praying for the recovery of a cancer parishioner. In arresting Father LIN Daixian, the security police beat savagely the parishioners who tried in vain to prevent the arrest of Father LIN. In the process, many parishioners were beaten and suffered severe injuries, including broken bones and teeth, brain injuries causing severe swelling, fainting, and many other kinds of injuries. The private house where the arrests took place was totally ransacked and severely damaged. Father LIN, the seminarian, and nine parishioners are now detained in the Pingtan detention center. Father LIN Daixian was arrested three times previously. The first time was on October 18, 2000 in connection with the canonization of 120 martyr saints on October 1, 2000 by the late Pope John Paul II. The second time was on August 15, 2001, and the third time was on November 22, 2001. This is his fourth arrest by the Chinese government for his religious beliefs. He is 40 years old and was ordained a Catholic priest in 1995. We do not know the name of the seminarian and the nine parishioners who were arrested with the priest. July 4, 2005: Underground Roman Catholic Bishop Arrested Again in China. Bishop Jia ZhiGuo 賈治國, the underground Roman Catholic bishop of the Diocese of Zheng Ding 正定in Hebei Province, was arrested again by two government officials at his house at approximately 3:30 pm Beijing time today July 4, 2005 and was driven away to an unknown location. The government officials telephoned Bishop Jia in advance, notifying him that he was being picked up and ordering the bishop that he was to tell the people that he was being taken away by the government officials to visit a physician. Bishop Jia is not sick at present and there is no need for him to visit a physician. We have no idea how long Bishop Jia will be taken away. Bishop Jia is 70 years old and was ordained a bishop in 1980. He was previously in jail for approximately 20 years and has been under strict surveillance for many years. He takes care of approximately 100 handicapped orphans in his house. This is the sixth time that Bishop Jia was arrested since January 2004. The first arrest was April 5, 2004. A car with four government security policemen suddenly appeared at the bishop's residence and took him away without explanation. The second arrest was September 9, 2004 when Bishop Jia was forced by two security personnel to take a tour for three days to Wentang 文溏Township in Pingshan 平山 County. Adding insult to injury, they forced the bishop to pay for the hotel and meal expenses, including for those government officials who watched over him. The third arrest was September 30, 2004 when Bishop Jia was forcibly taken away by security personnel of Shijiazhung 石家莊district. The arrests on December 14, 2004 and January 5, 2005 were Bishop Jia's fourth and fifth arrests. April 27, 2005: Arrest of Seven Underground Roman Catholic Priests in China. Seven priests belonging to the Diocese of Zhengding 正定, Heibei 河北 were arrested at 5:30 pm April 27 Bejing time in Wuqiu Village 武邱村 of Jinzhou city晉州市. These seven priests had traveled from their parishes for a religious retreat conducted by Bishop Jia Zhiguo who had just been released from 24-hour surveillance during the period of approximately March 30 to April 25 when Pope John Paul II was dying and when the new Pope Benedict XVI was elected. The mass arrest of priests was made by the Security Bureau of Shijiszhuang 石家庄, officers of the religious bureau, and dozens of police riding in nine police cars. Bishop Jia was warned by the Public Security and religious bureaus not to initiate any religious activities. The seven priests were sent to the Security Bureau of their respective parishes as stated below. The arrested priests are: (All ages are approximated) Fathers WANG Dingshan 王進山 (50), LI Qiang 李強(31), and LIU Wenyuan 劉文元 (35) from Gaocheng 高城縣. Father ZHANG Qingcai 張慶才(45) from Wuji 無極縣 County. Father LI Suchuan 李素川 (40) from Zhaoxian 趙縣. Father PEI Zhenping 裴正平 (43) from Luancheng . Father YIN Zhengsong 尹正松 (32) from Dingzhou 定州. April 3, 2005: Arrest of An Underground Roman Catholic Bishop and a Priest. Bishop YAO Liang 姚良, the auxiliary bishop of the diocese of Xiwanzi 西灣子 in Hebei, was arrested on March 31, 2005. He is in his early eighties. Before his arrest Bishop YAO had been under mounting pressure from the Chinese authority to sever ties with the Pope and join the official Catholic Church (the Patriotic Association). However, the bishop refused to do so. The faithful in Xiwanzi diocese believe that his refusal to join the official Church could be the reason for his arrest. We do not know where he is being held. There are no further details. Father WANG JinLing 王進齡 of Zhangjiakou 張家口, also in his early eighties, was arrested on April 1, 2005. We do not know why he was arrested, nor do we know where he is being held. In addition, the Chinese authority is intensifying surveillance of the underground bishops. Bishop HAO JingLi 郝進禮, 89, the bishop of Xiwanzi, and Bishop Jia ZhiGuo 賈志國, 71, bishop of Zhengding 正定, both from Hebei, are now under 24-hour surveillance by the Chinese security bureau. We do not know the reasons for this intensified surveillance. All these imprisonments and disappearances, especially those of Bishop Su, Bishop An, Bishop Han, and Bishop Jia, not only violate Chinese own law, but also violate the generally accepted international standard of human rights and international laws. The Chinese government has been trying to force the underground faithful to join and register with the official Patriotic Church since 1957 without much success. Now they are doing it with a new vigor. Those who refuse to join and register with the Patriotic Official Church are now liable to be put in labor camp for 3 years. So, it is now also a crime punishable by three years in labor camp when a person is ordained as an underground Roman Catholic priest and conducts evangelization without permission from the Chinese government. Persecution takes place not only in the form of imprisonment and torture, but also in the form of harassment. For instance, Bishop Fan Zhongliang, the underground Bishop of Shanghai and also the successor of Cardinal Kung, planned a thanksgiving Mass on December 15, 2005 for his 90th birthday and 20th anniversary of his ordination as a bishop. Approximately 60 underground faithful planned to attend the Mass in his tiny apartment. Mind you there is no open church in Shanghai for the underground church. But two days before the thanksgiving Mass, the public security bureau in Shanghai notified the Bishop that such a thanksgiving Mass is not allowed to celebrate and forced the cancellation of this celebration. To make sure that this thanksgiving Mass was cancelled and that there was no gathering, two policemen were dispatched to watch over Bishop Fan's apartment to make sure that this gathering did not take place. It did not. This is just an example. Regardless of the persecution described above during the last 57 years, the population of the Roman Catholic Church in China exploded from approximately 3 million in the early 1950's to approximately 12 million now. The persecution of Roman Catholics in China is obviously not ancient history. The persecution continues and gets worse and bolder at a time when China is making significant economic progress, at a time when China has joined the World Trade Organization, and at a time when China has become an important member of the international community. The persecution also continues and gets worse and bolder at a time when the Chinese government will host the Olympic Games in 2008. The spirit of the Olympic Games is being downgraded by their coexistence with the evil spirit of religious persecutions in China. The noble name of "Olympic" is being severely tarnished by its association with religious persecutions and human rights violations in China. In view of the above, on September 1, 2005, I wrote a letter to President Hu Jintao of People's Republic of China, appealing to him "to bring modern China into an era of true religious freedom," reasoning with him that "a country without religious freedom is never peaceful and constructive" and challenging him to realize "the importance of changing the world's perception of China's human rights policy for the better." We also not only appealed to President Hu that "all these (religious) prisoners, both living and dead, be officially and posthumously exonerated of so called crimes, some as long as five decades ago," but also appealed to him "to release all current religious prisoners from prison and labor camp…" We concluded that "to do so will be a powerful testimony to the Chinese government's respect for and adherence to human rights and liberty. To do so will also prove that China is honoring the spirit of the Olympic Games that (she) will have the honor of hosting in 2008." Unfortunately, President Hu has never replied to our appeals, and instead, the arrests of religious believers continue. I respectfully request that, hopefully through the influence of this hearing, President Hu's attention be directed to our appeals and that he give an order to his government to rectify the situation. He has the power and authority to do so. Otherwise, the Olympic Committee should take note of these arrests and decide whether or not China's continuous persecution of innocent religious believers is in conformity with the spirit of the Olympic games. We also hope that the Olympic Committee would use its influences to convince China to change its human rights for the better. Should we support a country by purchasing its goods and services when such a country has no regard for the human rights principles held so dear to our founding fathers, and held so dear to us, to our children and family? Should we support a country that is increasing its military budget with very suspicious motives? Very often, the low price tag associated with "Made in China" was achieved on the blood and backs of many religious prisoners in the labor camps. The communist Chinese government obviously does not share our principles and values of human rights, but we must let China know that religious persecutions in China will hurt them, at least financially. We need to examine carefully the labels when we make a purchase. The small savings you received from buying something made in China actually indirectly strengthens a government who persecutes its own citizens.